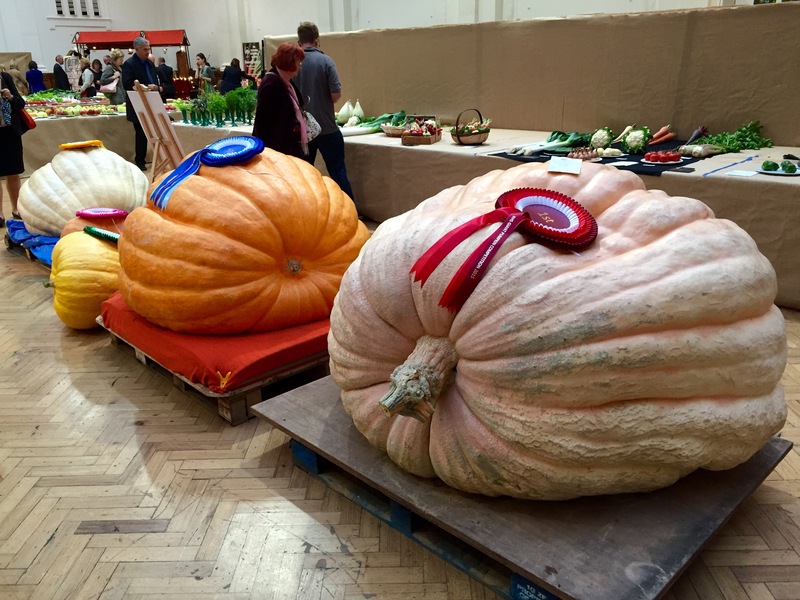 I always write my post about the RHS Autumn Harvest Festival Show will a tinge of sadness, as it falls just a few days before I head off to China. The dazzling displays of fruit, vegetables and autumn foliage remind me what I’ll be missing over the next three weeks. Of all the RHS London events I find the Harvest Festival Show the most nostalgic. I can almost imagine Lady Grantham gliding past the exhibits, nodding politely at be-tweeded Head Gardeners as they present the fruits of their labours. This show has changed very little over the last 100 years – a reminder that there are still folk who have the zeal to grow fine fruit and vegetable for the exhibition table. The show programme is similar every year, so much so that I can even recall where different competition classes will be displayed. Their Graces the Duke of Marlborough and the Duke of Devonshire still do battle with their grapes but, as we’re witnessing in the latest series of Downton Abbey, the age in which the landed gentry dominated these shows is long past. 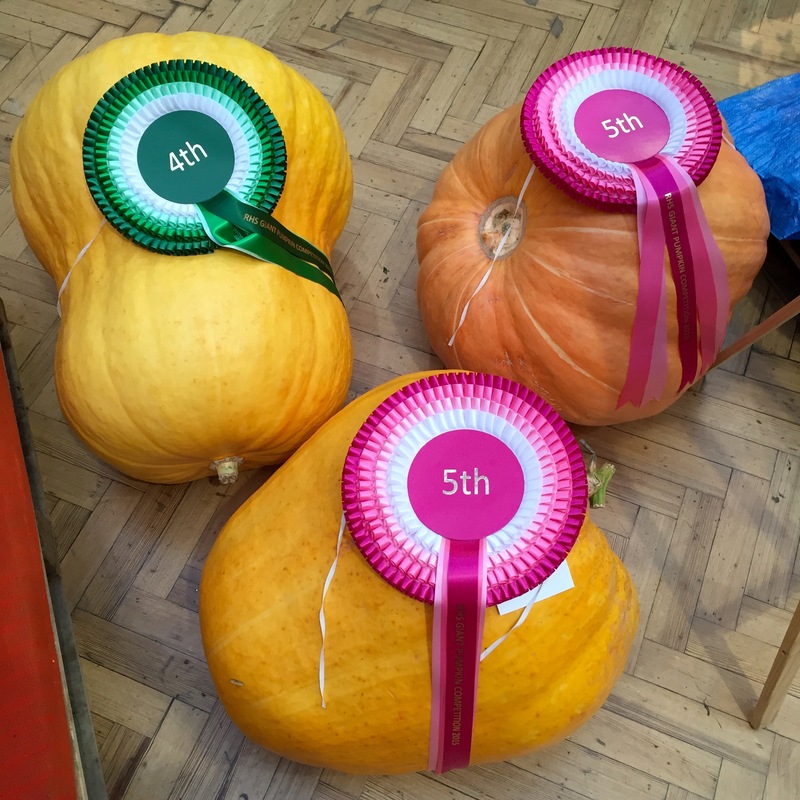 In the giant pumpkin competition it was schools rather than Earls in 2nd and 5th position. 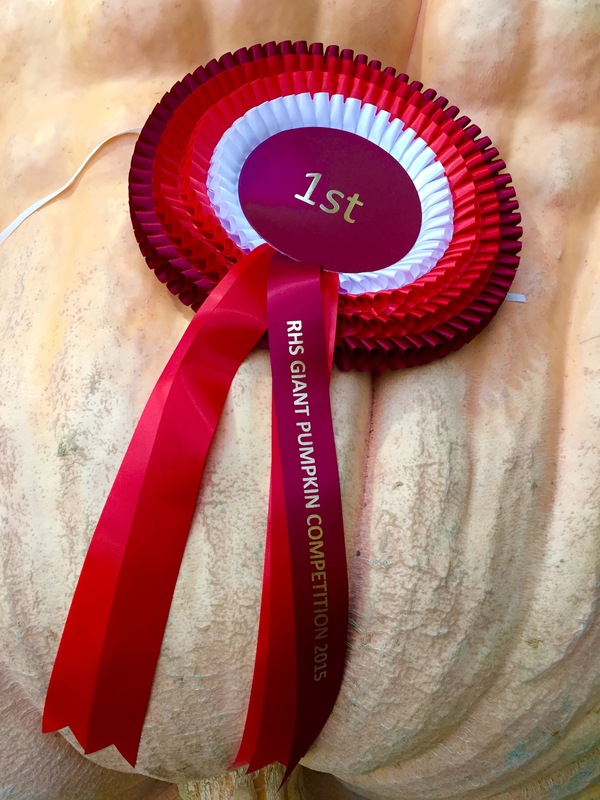 The glory of first prize went to Ian Paton with a plumptious fruit weighing 509kg (1112lbs) – that’s not far off the weight of a Shetland Pony. (I recall that in 2012 the same prize was awarded to one Stuart Paton with a fruit weighing 478kg. I can only assume these two pumpkin professionals must be related.) I cannot look at these fecund fruits without thinking of those obese, bedridden people that one sees on Channel 4 documentaries. However, despite their ripples and wrinkles there’s nothing faintly fleshy about them: they are hard as nails and not in the least bit saggy. The sweet and sour scent of ripening apples hit you the moment you entered the Lindley Hall, discreetly illuminated for the special ‘Late’ event on Tuesday evening. It is the very essence of autumn, delicious yet hinting at decay. As usual exhibition displays of apples were prolific as well as perfect. 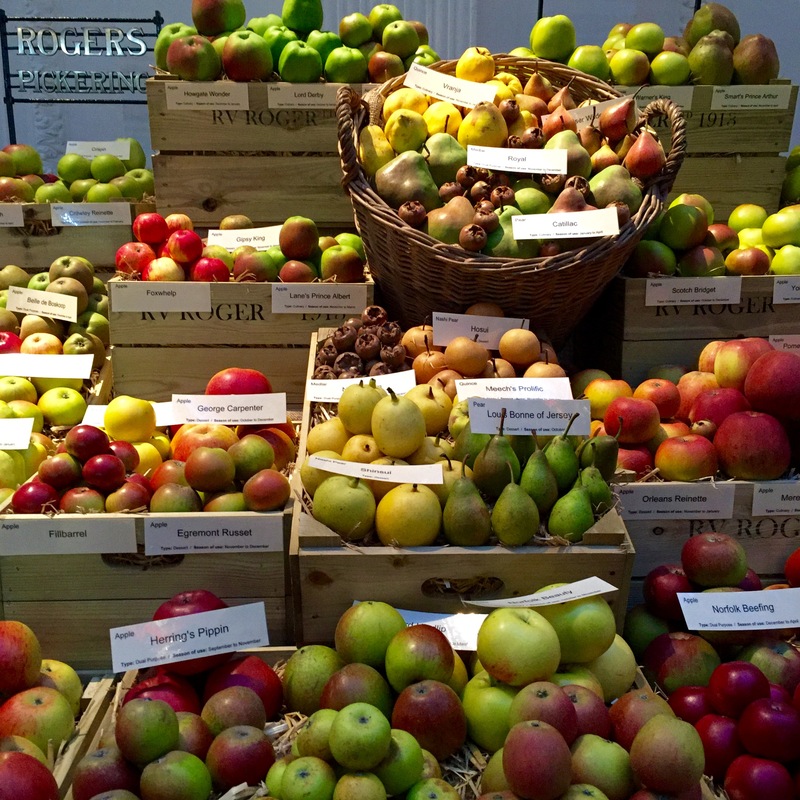 R. V. Roger, a specialist in field-grown fruit trees, staged a mind-boggling display of varieties old and new. I asked advice about growing some low espaliers in our London garden and was encouraged to consider what kind of flavours and eating qualities I liked so that they could offer the best choice. If you are interested to know more, R.V. Roger are holding a special Apple Weekend this very weekend, the 10th and 11th of October, at their nursery in Pickering, North Yorkshire. I wish I could be there. It would not be the Harvest Festival Show without rod-straight root vegetables, trim tomatoes and perky potatoes. 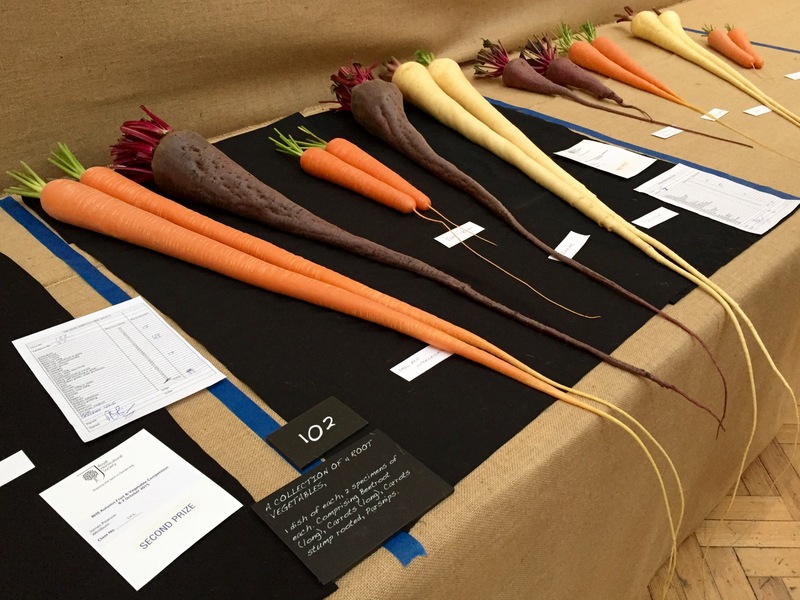 Simon Smith from Loughborough showed us how first prizes are won with his entry into the ‘Collection of 4 Root Vegetables’. Us lesser gardeners can only admire such patience and attention to detail. I am just happy if my vegetables taste good. 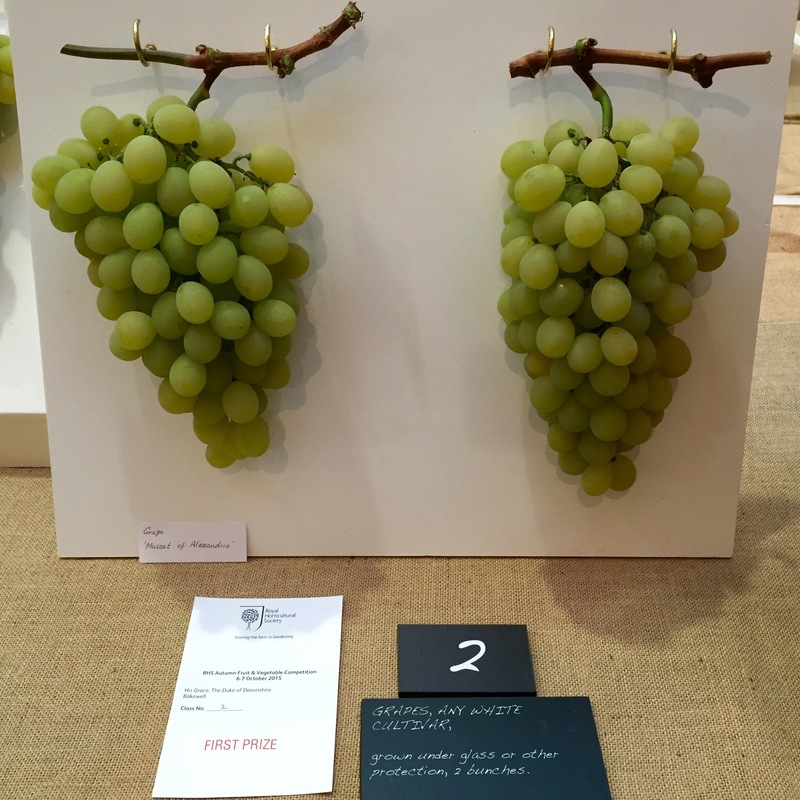 If you’d like to look back over previous RHS London Harvest Festival Shows, follow these links: 2012, 2013, 2014. Have a wonderful weekend one and all! And first prize goes to …… Ian Paton! I have a very soft spot for the RHS London shows as they are part of the reason I got hooked on gardening. By an incredible feat of denseness it took me a couple of years to realise that the venue I was taking my professional exams in (and where there were always daffodils in the basins in the Ladies), was the same venue my mother was attending the RHS Spring Show a couple of days earlier. I vowed that once I’d finished my exams I would return to the venue with her, to enjoy the flowers, rather than the stress of exams. And so it was, years of rather rushed post work Tuesday visits, followed by very long suppers talking about it all. I want one of those rosettes!!! What an inspiration. Those carrots blow my brain, how do they achieve this!!! Every year I have seen this post and want to work out how I can visit this show. Vegetable heaven…..pumpkins here a bit different in comps I think. It is about the massive weight that can be achieved and we are talking some incredible kilos… They have to be delivered in trailers… Have a great trip and enjoy the bok choy!!!!! Thanks Helen. You would really marvel at some of the entries. I try each year to show a slightly different mix. There were some superb potatoes and cauliflowers too. I just pulled out the last of our courgettes, and the tomatoes which had become blighted. Alex has been making chutneys and pasta sauces for the freezer all afternoon! What a curious name for a rabbit! I am sure there must be a story there Judy? She would Judy, she adores rabbits, especially pink ones it seems! It is all so impressive. Don’t they have slugs and bugs on their plots? I loved your picture of the root vegetables. I remember hearing a gardener describe how he grew his parsnips in long downpipes (in soft, sandy soil) in preparation for his competitions. Yes, I believe this is how it’s done. They must have to be removed very skillfully to keep the thin end of the root intact. If it makes you feel any better I did spot some tomatoes that were slightly blemished. Needless to say they didn’t win a prize, but they were a good reminder of reality! An amazing show; I would love to see this. Looks like one of the giant pumpkins sits on a pillow…now that’s dedication to your fruit & veg! Glad my veg impressed you! The pumpkins are very big indeed. Do people eat them? One could be good for many pumpkin pies! I love the carrots most, all look so perfect…and very disciplined. I am not sure how edible those pumpkins are. They must be all water and very little taste. The grower of the root vegetables, Simon, has very kindly left a comment on this post explaining how he grows his incredible vegetables. Much dedication required! Here’s how the long carrots and parsnips are grown. I grow my long roots in bottomless drums of sand, set on top of another raised bed of sand to give the required depth (5’6″ in my case). In the Spring I bore cylindrical holes in the sand with a crowbar and fill these holes with a ‘mix’ of compost, soil and various other goodies depending on the crop. If anyone is interested i’m quite happy to let you have this information. It is quite detailed but there is no secret ingredient. Yes we do get slugs and snails and I take the requisite precautions, and I do erect a mesh frame over each drum to keep carrot fly and other beasties out. From then on it’s just a case of careful watering and keeping an eye out for any bugs that do manage to get in somehow. They are more robust than you think and do come out quite easily at harvest time if you excavate around the root for a foot or so to give you a good handhold. If they resist it usually means they’ve forked lower down. These ones don’t make it to the shows! I have an old bath in the garden in which I can immerse them to give them a thorough wash before they are wrapped up ready for transporting to the show. Beautiful pictures, thank you for the info. Believe me Dan, if I can become a champion grower anyone can do it! 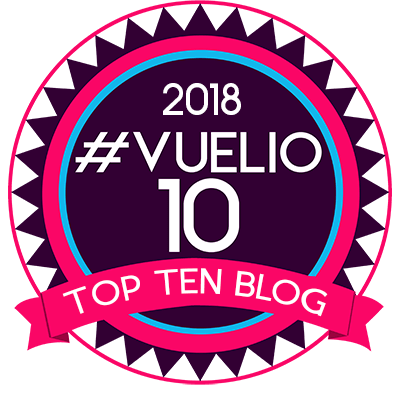 Thanks to the internet growing for show has had a bit of a surge in recent years, to the extent that winning at the highest level has become very hard indeed. It is of course very much a unique thing to the British Isles so I’m not surprised your foreign colleagues find it fascinating, if not a little weird I’m sure! Rest assured all of the veg (apart from the monster veg) is perfectly edible as one of the stipulations in the National Vegetable Society judge’s guide is that quality and condition is paramount. The next most important criteria is uniformity followed by shape, form and size. Size is the least important in terms of the points available, typically only 3 or 4 of the 20 available for crops like carrots, parsnips, onions, leeks, potatoes, celery and cauliflowers for instance. Thanks for highlighting the hobby on your blog. Have a good trip. Fabulous show, so inspiring! Thank you for the photos. It certainly made me want to grow more fruit and veg! Lovely photoessay. I’m a pushover for nice veg. I’m glad to hear, too, that there are other mechanisms behind those extraordinary root vegetables that traditional planting–the prospect of double-digging (septuple-digging?) to accommodate those monsters shrivels the soul. I don’t mind a bit of digging. Like anything else, if it’s at your own leisure it’s fine, but if you are forced into it digging can be a bit of a chore. My Australian friend swears by ‘no dig’, especially for potatoes.